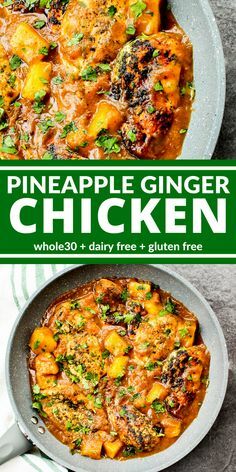 This Pineapple Ginger Chicken is tangy and sweet. No sugar. No junk. Just big bright flavors like pineapple, medjool dates, and fresh ginger. So good I bet you'll lick your plate. Add olive oil to saute pan or cast iron skillet. Heat pan to medium high heat.Add chicken to hot pan. Sprinkle salt, pepper, and dried parsley on top of each breast. Cook until browned, about 5 minutes. Flip. Cook other side until browned, about 5 minutes. Turn chicken over so your herbed side is facing up. Turn off heat. Add all sauce ingredients to blender. Blend until smooth. Pour blended sauce into the pan with your chicken. Add cup of chopped pineapple around chicken. Reduce heat to medium low or low. Cover and simmer for 5 minutes. Sauce will reduce a bit. Top with fresh chopped parsley and serve!